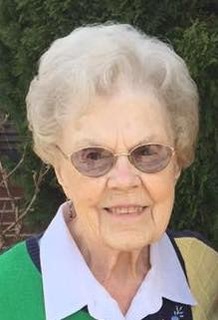 Marjorie Ross, 98, of Barry, formerly of Rochester, passed away on Monday, September 3, 2018 at Barry Community Care Center. Marjorie was born on July 10, 1920 in Berry the daughter of Charles and Maude Killion Spengler. She married Harold Ross on August 7, 1940; he preceded her in death. She was a RN and a member of the Daughters of the American Revolution, Rochester Historical Society and Garden Club. She was also preceded in death by her parents and one son, Charles “Joe” Ross; and all but one of her ten siblings. She is survived by one son, Harold James Ross; daughter-in-law, Janet Ross; four grandchildren, six great-grandchildren; one great-great-grandchild; and several nieces, nephews and cousins. Visitation will be from 10:00 a.m. until the time of the funeral service at 11:00 a.m. on Thursday, September 6, 2018 at Wilson Park Funeral Home in Rochester with Reverend Bennie Fisher officiating. Burial will follow at Oak Ridge Cemetery. Memorial contributions may be made to the Rochester Historical Society.